Yes, this only includes “full” bottles of chilled premium Champagne. You know… advantage players will try to get away with anything. 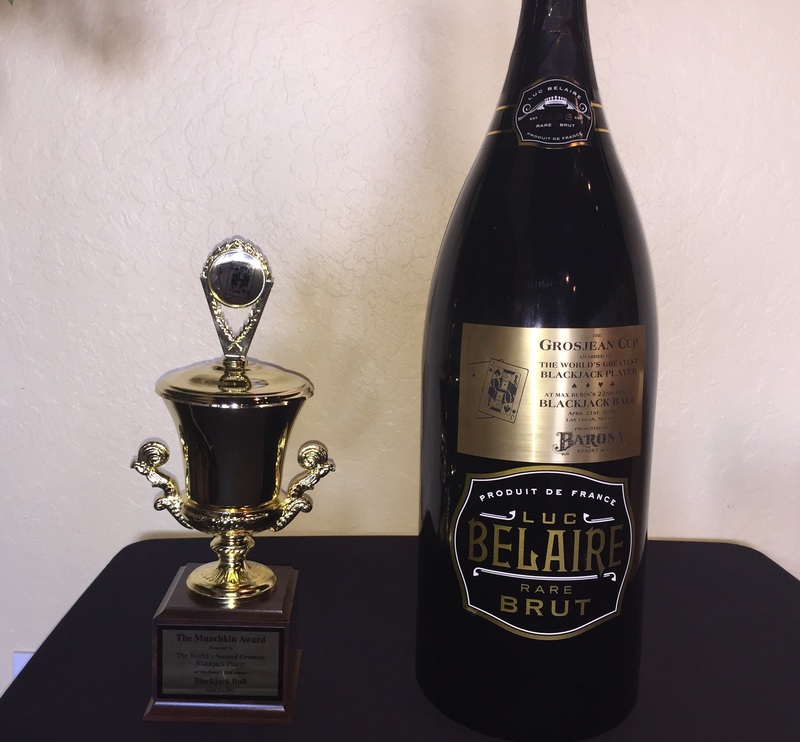 🙂 For the 2018 Blackjack Ball, I brought a nice bottle of Tsarine Cuvee Adriana… a fancy looking gold bottle of French Champagne. to get past the security at the door. Voting generally occurs at this event for new inductees into the Blackjack Hall of Fame. 2008 James Grosjean2)James Grosjean was barred from winning any more of these contests in 2008. But they named the prize after him! 🙂 Check Max Rubin’s site for more information. DATABASE ENTRIES3)Database entries above may be incomplete. I am looking for exact Blackjack Ball dates to complete 1997 – 2010. Did you attend? Know the date? Let me know! On this day (approx) in 1997, Max Rubin held the 1st annual Blackjack Ball - an event to celebrate the greatest blackjack players, experts and authors. Wally Simmons won the Blackjack Cup trophy this year for World's Greatest Blackjack Player. On this day in 2008, Max Rubin held the 12th annual Blackjack Ball. James Grosjean won the Blackjack Cup trophy this year for World's Greatest Blackjack Player. The Four Horseman of Aberdeen were inducted into the Blackjack Hall of Fame. On this day in 2011, Max Rubin held the 15th annual Blackjack Ball. Michael Shackelford won the Grosjean Cup trophy this year for World's Greatest Blackjack Player. Zeljko Ranogajec was inducted into the Blackjack Hall of Fame. On this day in 2012, Max Rubin held the 16th annual Blackjack Ball. "Mr. Yuk" won the Grosjean Cup trophy this year for World's Greatest Blackjack Player. Ian Andersen was inducted into the Blackjack Hall of Fame. On this day in 2013, Max Rubin held the 17th annual Blackjack Ball. Richard Munchkin won the Grosjean Cup trophy this year for World's Greatest Blackjack Player. There was no voting for induction this year into the Blackjack Hall of Fame. On this day in 2014, Max Rubin held the 18th annual Blackjack Ball. "Smoke" won the Grosjean Cup trophy this year for World's Greatest Blackjack Player. Bob Nersesian was inducted into the Blackjack Hall of Fame. On this day in 2015, Max Rubin held the 19th annual Blackjack Ball. Rick Blaine won the Grosjean Cup trophy this year for World's Greatest Blackjack Player. Don Schlesinger was inducted into the Blackjack Hall of Fame. On this day in 2016, Max Rubin held the 20th annual Blackjack Ball. Lee Jenson won the Grosjean Cup trophy this year for World's Greatest Blackjack Player. Bill Benter was inducted into the Blackjack Hall of Fame. On this day in 2017, Max Rubin held the 21st annual Blackjack Ball. Anthony Curtis won the Grosjean Cup trophy this year for World's Greatest Blackjack Player. Don Johnson was inducted into the Blackjack Hall of Fame. On this day in 2018, Max Rubin held the 22nd annual Blackjack Ball. "Wahoo" won the Grosjean Cup trophy this year for World's Greatest Blackjack Player. Wally Simmons was inducted into the Blackjack Hall of Fame. 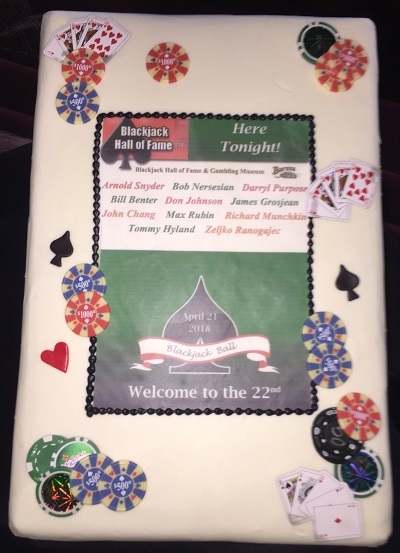 On this day in 2019, Max Rubin held the 23rd annual Blackjack Ball. 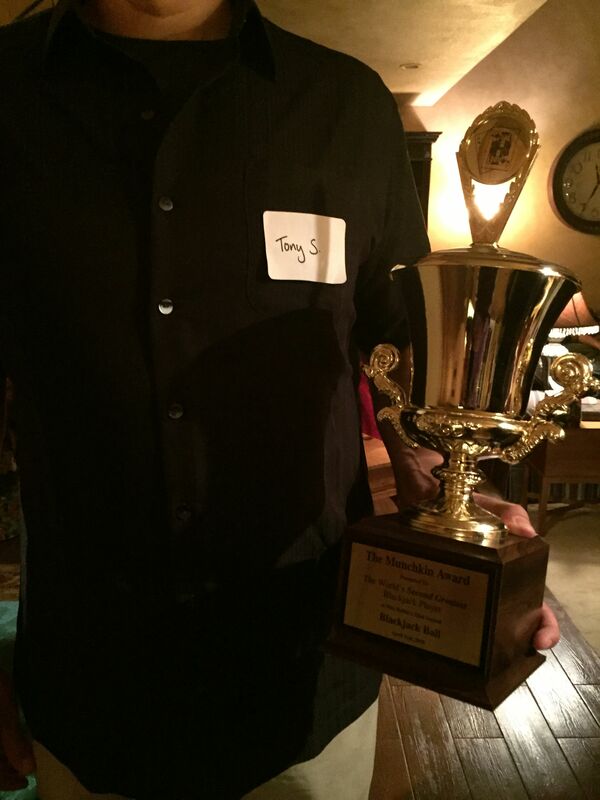 "Tony S." won the Grosjean Cup trophy this year for World's Greatest Blackjack Player. Rob Reitzen was inducted into the Blackjack Hall of Fame. In 2018, the Munchkin Award for the “The World’s Second Greatest Blackjack Player” was won by “Tony S”. Yes, this only includes “full” bottles of chilled premium Champagne. You know… advantage players will try to get away with anything. 🙂 For the 2018 Blackjack Ball, I brought a nice bottle of Tsarine Cuvee Adriana… a fancy looking gold bottle of French Champagne. 2. ↑ James Grosjean was barred from winning any more of these contests in 2008. But they named the prize after him! 🙂 Check Max Rubin’s site for more information. 3. ↑ Database entries above may be incomplete. I am looking for exact Blackjack Ball dates to complete 1997 – 2010. Did you attend? Know the date? Let me know!